ALICE FREEMAN WAS AWARDED A CHEQUE FOR $5,000 AT THE MASONIC CENTRE, DUNEDIN, NZ. In the evening of the 10th December a contingent of trustees from the Otago Masonic Charitable Trust (OMCT) gathered to welcome this year's recipient of the Port Chalmers Marine Lodge bursary. This award is given to the most promising Year-13 student in the Port Chalmers district to assist them finance their studies as they embark on tertiary education. 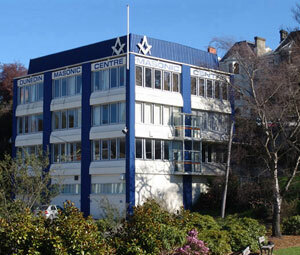 Logan Park High School student Alice Freeman was this year's worthy winner and evinced some curiosity as she was led into the ground floor temple within Dunedin Masonic Centre. Flanked by her parents Louise and Graeme, a short history of, and the philosophy behind, Freemasonry were outlined to the family by Rt.W.Bro. Gordon Baines, principal trustee of the Marine Lodge. He went on to explain that Alice had faced robust competition from the other applicants but that the persuasiveness of her professional presentation had eventually swayed the committee. Rt.W.Bro. Baines presented a delighted Alice with a cheque for 5,000 dollars and requested that she return in June, to the official meeting of the Otago Masonic Charitable Trust Awards, whereupon she will receive her Certificate of Merit from Steve Williams, Chairman of the Port Chalmers' Community Board. One noticeable absentee from the presentation was V.W.Bro. Mel Darling, Secretary of Lodge St. Patrick, whose understanding of the nuances of the language of soccer must be somewhat threadbare. The phrase "bend it like Beckham" refers, of course, to the ball in play and not one's own left leg! Mel's place was filled by the IPM, W.Bro. John Wren-Potter. "In 2005 unfortunately the Port Chalmers Marine Lodge, No. 942, English Constitution, closed after 140 years. The members wished to preserve the name of the Lodge in Port Chalmers and, to this end, they established a Trust to provide an annual bursary to applicants resident in the Port Chalmers district. This is awarded each year to a high school leaver, and is administered by the Otago Masonic Charitable Trust via an elected sub-committee. The first bursary was awarded to Jennifer Aitken in 2007." FROM 'A 50-YEAR HISTORY OF THE OTAGO MASONIC CHARITABLE TRUST' BY GRAEME D MUNRO.